I enjoy living with so many beautiful places so close around, and I also enjoy showing these places off to friends who visit me. Last week - on one of the few days without rain - I took a couple of friends for a quick visit to places around here that I especially enjoy. We drove first to Inskip Point and walked from the parking place out onto the sand at the end of the point. Unfortunately there were no shorebirds waiting for us as there were too many people around and the tide was not right. 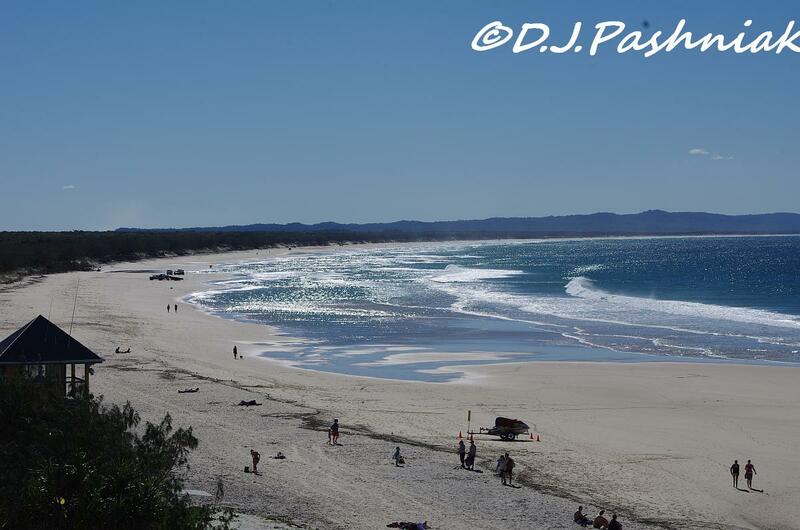 However, the scenery is always beautiful - this photo is looking from the road over towards Fraser Island. 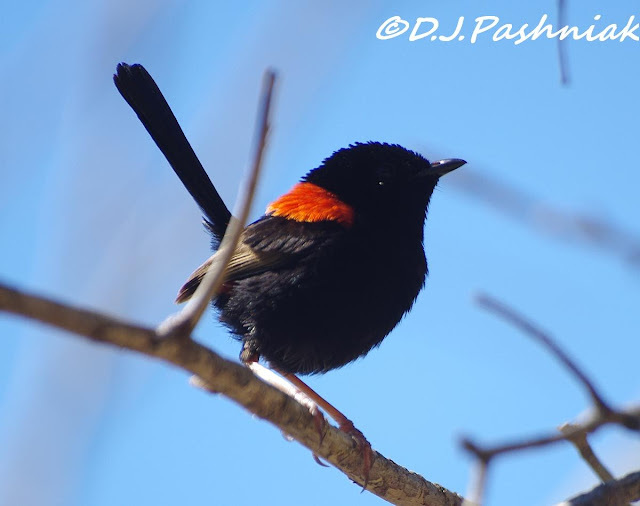 There are always bush birds to see and this little Red-backed Fairy Wren was fluttering around in the same tree where I saw a pair last time. I wonder if there is a nest close by. We then drove on to Carlo where there is a ramp for boat launching and various other boats moored to the docks. There are also picnic tables and shelters - a perfect place to sit and eat and enjoy the sound of the birds high in the trees above. We saw a group of pelicans further along the shoreline and were walking towards them when they suddenly moved and swam past us. 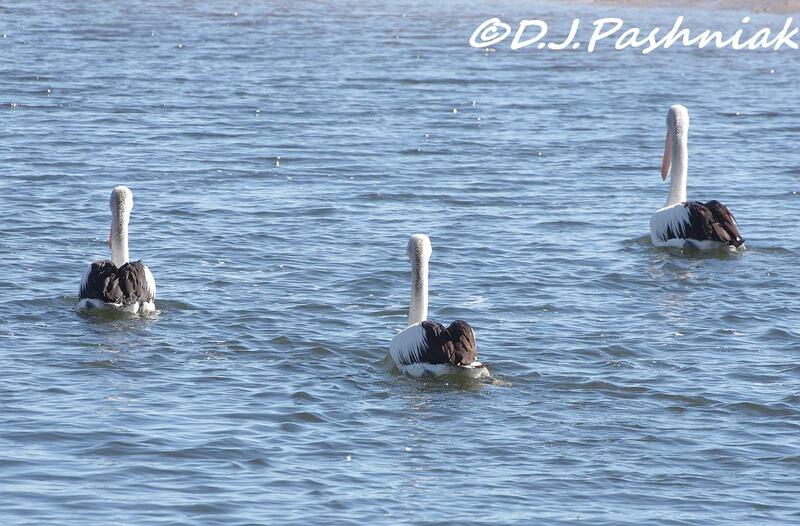 There were a couple of small boats just coming in to land and the birds obviously were hoping for a hand-out! When it didn't happen quickly enough a couple of them flew up and perched on one of the lamp stands. It always seems strange to me to see these big birds perched way up high like that. There were other people sitting at another picnic table and I don't know if these crows were being fed or if they just hoped to be. I realized a while ago that I had never photographed crows up close. 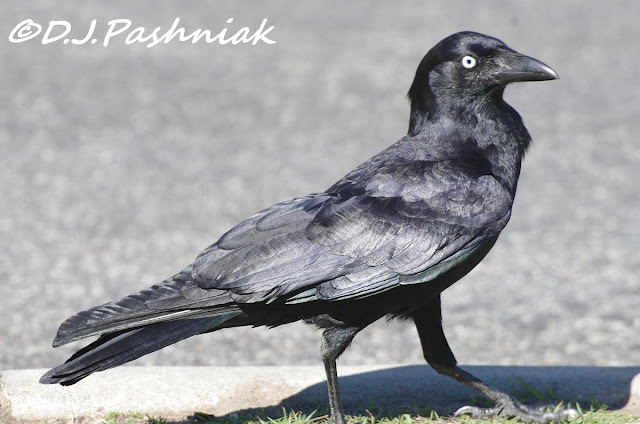 They are handsome birds but I can't help thinking of the old saying - "handsome is as handsome does"- and crows are noisy bullies and have the nasty habit of taking small birds out of nests and sitting and eating them while the parent birds scream and cry in frustration! 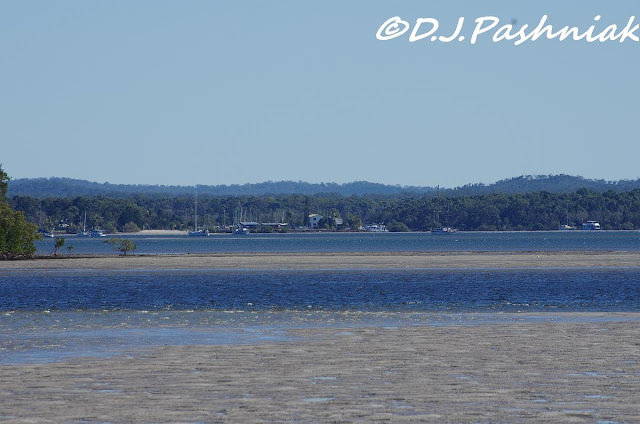 There is also a distant view from Carlo over the bay right back to Tin Can Bay. We then drove back to Rainbow Beach and looked at the beach from the viewing platform close to the surf club building. This photo is looking north along the beach. 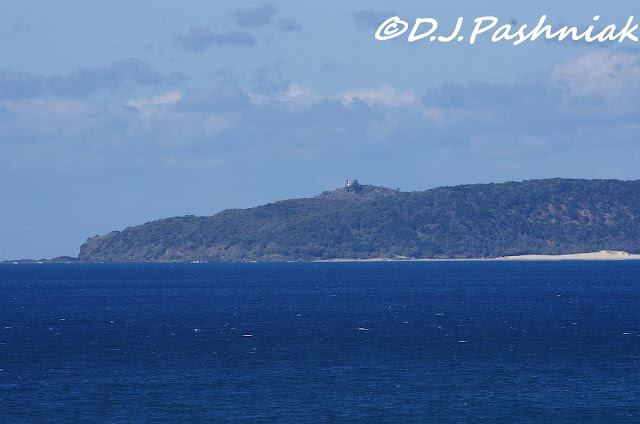 This photo is looking south towards the lighthouse on Double Island Point. The Seary's Creek picnic area is on the way home. There is a board walk through the bush which leads down along the creek. 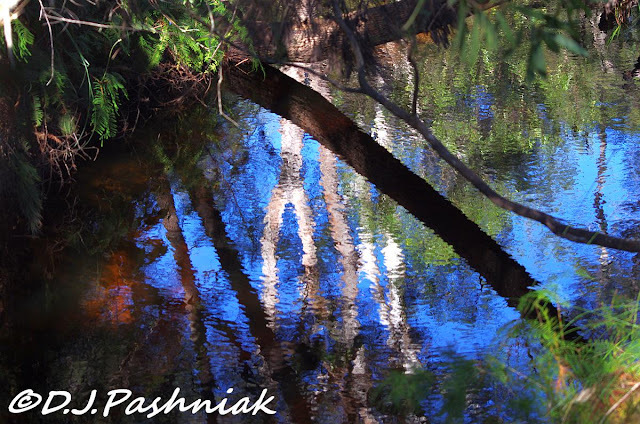 It's beautiful and peaceful and I am always fascinated by the color of the water and the reflections of the trees and bushes in it. i love crows, but i cannot help but smile at the fairy wrens! I've never seen a fairy wren before. What a beautiful little bird! And a nice photog. I do love your birds -- all of them, and what terrific captures for the day, Mick!! Thanks for sharing the beauty and the fun! It certainly looks a lovely place to belong to Mick, no wonder you like to show it off to friends. 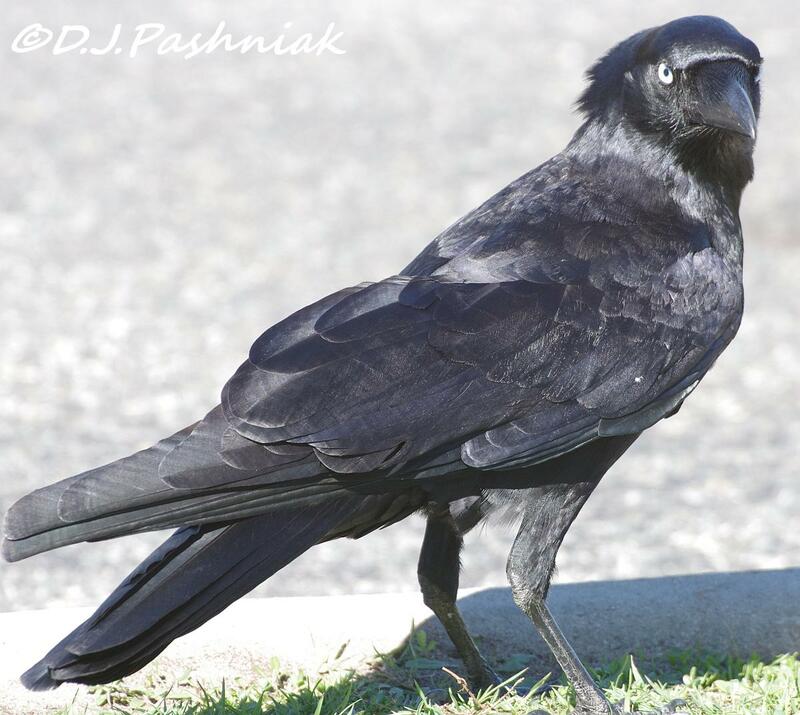 You captured the crow well - made it look mean, handsome and intelligent all at the same time. Great place. Love the fairy wren, and the reflection shot!! Boom & Gary of the Vermilon River, Canada. Wonderful shots of birds. I like that bird on the tree. I love the Fairy Wren and the pelicans on the light pole! I've always like crows. Nice shots! 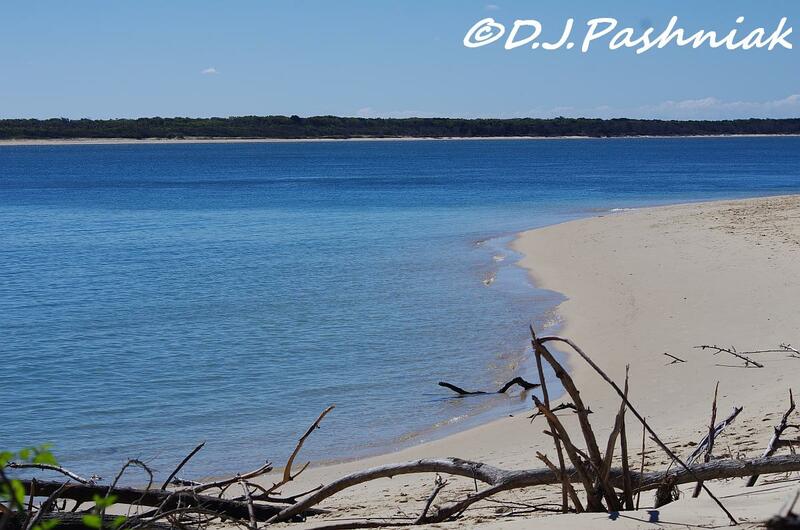 I just love the blue sea in the first image... many thanks for sharing your stunning images. I love the cute fairy wren and cool captures of the Pelicans. Beautiful scenic shots, Mick! Beautiful scenery and lovely birds. Crows are so intelligent and interesting and the little Fairy Wren is adorable. What wonderful scenery you have! Love the water and the birds so much. 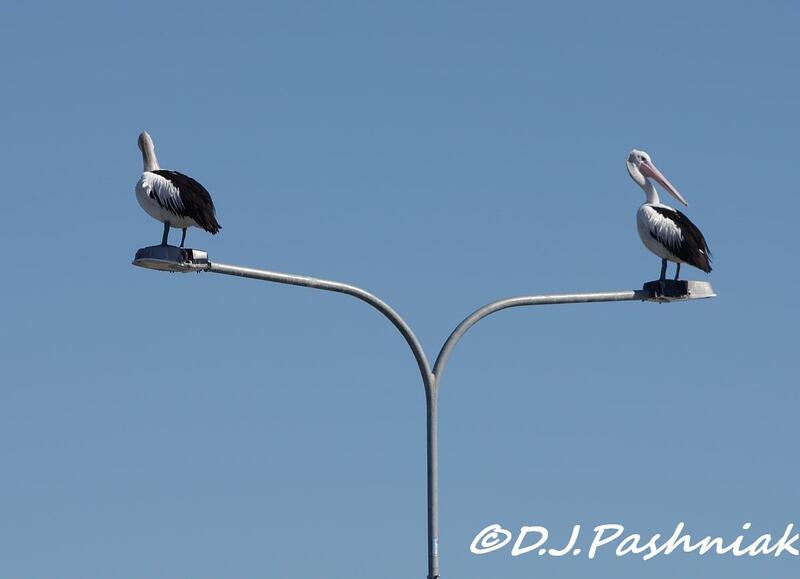 And the pelicans on the lamps are just so cool! When I moved to New Zealand 7 years ago, Hubby (who had been here for 20 years) was surprised at my reaction to the place. I think he had forgotten his first sights of beauty here. You live in a lovely area! The fairy wren is so cute! I love pellies and the duo on the lightpost are great! I admire your beaches so much. Yes the crows do the same thing here. 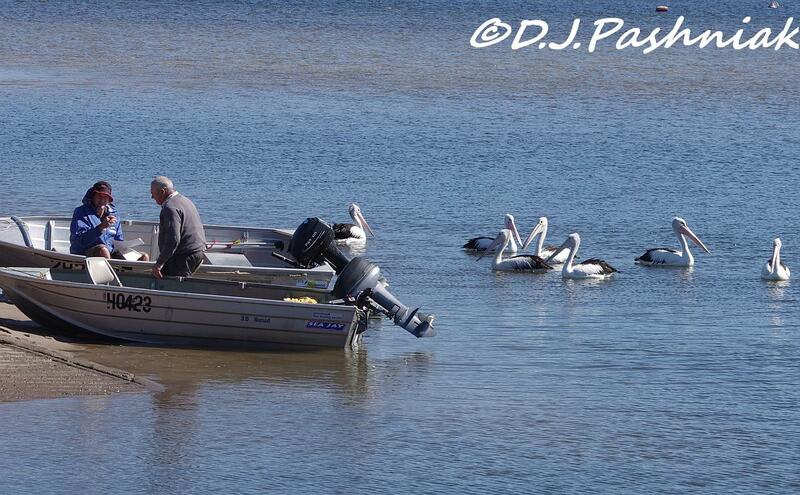 Can you get close to those Pelicans. Well that boat is close! Lovely photos! Very nice place where you live. Beautiful photos. The tiny wren is so sweet. I do like the way the pelicans always seem to sit on the most ridiculous places! Great photos, great blog. We have friends at Esk. ...that Red Backed Fairy Wren....I want them over HERE in America!!! Pretty, cute, adorable and oh so colorful. Jealous I am. So very nice and beautiful place you live in! I love the little fairy wren and pelicans are intersting. We don't have either of them here in Sweden. Lovely photos, Mick! Thanks for your sweet comment! Beautiful pictures, the scenery is amazing. What a beautiful day-out with friends .... I 'm sure they enjoyed it . I love that pretty little red capped fairy wren sitting on twigs .... a treat to the eyes. Well, Mick, you certainly have the scenery!! And a fair share of birds, too! I can understand your pride and wanting to show off such beauty to your friends. Thank you for sharing it with us, too! Beautiful places Mick. Your company was lucky to have such a great guide! The second crow portrait captures their bullying personality perfectly. He looks like a bird I wouldn't want to meet in a dark alley. Hi Mick, I enjoy you post and I hope you do not mind I linked up your blog as one of my favorites to visit on my recent post today. That honeyeater is pretty by all means, but I so wish we had that beauty...the fairy wren, in OUR part of the world!! Loved the tour Mick. It's always such a pleasure to visit your blog and now even more so as I have seen these places myself. We loved our holiday up your way. I love the little Fairy Wrens. I'd love a lens like yours to get that much closer. I love Pelicans and I too am intrigued at the way they sit on top of light poles. In fact, my next weeks post was going to be on Pelican antics.